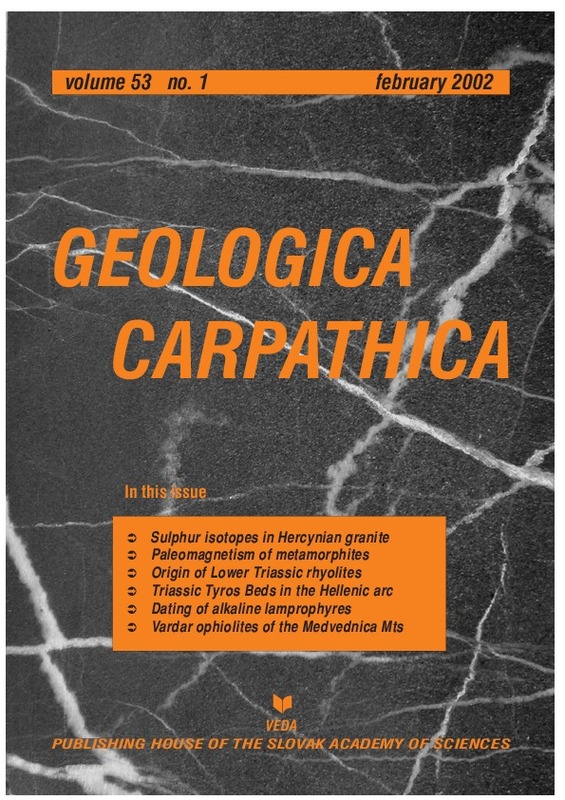 Abstract: A reconnaissance sulphur isotopic study has been carried out on selected Hercynian granites and related rocks to test the applicability of such data in constraining the relative contribution of igneous and sedimentary protoliths to the West-Carpathian granitic rocks. Chemical separation techniques yielded enough sulphide sulphur for analysis in 22 out of 26 selected whole rock samples. In general, more mafic rocks, showing higher whole-rock bulk sulphur content, yielded more sulphide for isotopic analysis than more felsic ones. The δ34S values obtained range from –0.9 to +5.7 ‰ (average +2.5 ± 2.3 ‰) for granites of S-type affinity, while results for I-type granites are lower, ranging between –2.9 and +2.3 ‰ (average –0.7 ± 1.9 ‰). Medium grade metamorphic rocks (gneisses ± mica schist) in the area gave values between –2.0 to +4.6 ‰ (average +0.8 ± 2.1 ‰) similar to S-type granites, while basic igneous rocks, and metamorphic rocks of obvious mantle affinity have a narrow span of values between –0.3 and +1.9 ‰ (averaging +0.7 ± 0.9 ‰). Despite the lithological variability implied above, the range of δ34S(CDT) values measured is rather narrow when compared with other granitic provinces elsewhere. The results presented here for the West-Carpathian granites fit better within a collisional orogenic setting than in a volcanic arc and/or oceanic subduction scenario. Sulphur isotopic results would be more easily explained within the frame of the I-/S-type model, while other data, such as magnetic susceptibility, could both fit the above and the magnetite-/ilmenite-series typology. Despite this, the data obtained could also be explained within a model in which some sulphur is of deep-seated igneous origin, having a distinctive isotopic composition, and some additional sulphur would be derived from the country rock via assimilation processes that resulted in the Central Western Carpathians granitoid rocks. Abstract: The paper extends our previous study of metamorphosed Paleozoic rocks of the Gemeric Superunit (Kruczyk et al. 2000) on four exposures of Paleozoic and two exposures of Triassic rocks. The anisotropy of magnetic susceptibility (AMS) results support the conclusion of previous study of its strong correlation with the tectonic Alpine fabric. Paleomagnetic data, obtained here only for two exposures (one Paleozoic and one Triassic) fit the previous results which indicate Middle Miocene remagnetization and subsequent rotations of respective tectonic blocks around local vertical axes. Abstract: Detailed study of Lower Triassic high-K rhyolites of the Drienok and Muran Nappes, the Silicic Unit, Inner Western Carpathians, reveals their alkaline and anorogenic nature. The rhyolites occur within shallow-marine to continental shale, sandstone and limestone platform sequences. The rocks are unusually K-rich (4.9–8.7 wt.% K2O), enriched in Si, Rb, REE‘s, Y and Zr and depleted in Al, Ca, Na, P and Sr. Rhyolite phenocrysts are represented by β-quartz and alkali feldspars. Zircon typology (mainly P5 and D types) indicates a hot and dry magma environment which corresponds to a high zircon saturation temperature: 820–895 °C. Accessory monazite-(Ce), xenotime-(Y), rutile, ilmenite, magnetite, hematite and barite were identified. The results indicate an origin of the high-K rhyolites in an extensional tectonic regime during the early-Alpine rifting stage. The exceptionally high K in contrast to very low Ca and Na contents in the rhyolites is probably a result of late-magmatic and/or post-magmatic (hydrothermal) overprint by K-rich fluids. This K-enrichment of Early to Middle Triassic volcanic rocks is a characteristic feature of the South Alpine–Inner Carpathian domaine during their Early Alpine continental rifting stage. Abstract: We describe a Middle Triassic volcano-sedimentary sequence, which outcrops on Rhodes Island at the southeastern edge of the Aegean Arc. The sequence is tectonically overlain by the Mesozoic calcareous platform of the local Archangelos Unit. The latter is regarded as equivalent to the Gavrovo-Tripolis Unit of mainland Greece and Crete. We propose that the volcano-sedimentary sequence described here is homologue to the Tyros Beds of Peloponnesus or the Ravdoucha Beds of Crete, which mark the stratigraphic base of the Gavrovo-Tripolis calcareous platform. Consequently we suggest that Tyros Beds characterize the base of the Gavrovo-Tripolis Unit all along the southern Hellenic Arc, from Peloponnesus through Kythira and Crete to Rhodes Island. Abstract: Amphiboles from two types of alkaline lamprophyres from the Silesian Nappe in the Polish Western Carpathians were dated by 40Ar/39Ar stepwise heating technique. Three teschenite samples representing mesocratic type of lamprophyres yielded similar ages of 122.3±1.6 Ma, while leucocratic lamprophyre represented by a syenite dyke gave 120.4±1.4 Ma date. These ages are interpreted as the time of magmatic emplacement during Early Cretaceous extensional episode within the Silesian Basin. Ages for both types of lamprophyres are identical within error limits, which points to fast (probably ca. 5 Ma) magma evolution from meso to leucocratic stage. Abstract: The ophiolite melange of the Medvednica Mountain area, located in the southwestern parts of the Zagorje-Mid-Transdanubian or Sava Zone, is included within the Vardar Zone (VZ) of the Dinarides. The melange represents the northwesternmost parts of the Dinaridic ophiolites, the origin of which was related to the Alpine evolution of the Dinaridic part of the Tethys. The Dinaridic ophiolites represent fragments of Mesozoic oceanic crust generated over 150 Ma starting with a) Late Triassic (?) to Late Jurassic oceanization of the Tethys, Late Jurassic/Early Cretaceous subduction, obduction and formation of the Dinaride Ophiolite Zone (DOZ) to b) Cretaceous–Early Paleogene back-arc basin final subduction and obduction, that is the formation of the VZ. The main Alpine compressional-collisional event, which took place in the Eocene (55–45 Ma) gave rise to the final structuration of the Dinarides and their uplift, and backthrusting of the VZ onto the DOZ. The Medvednica ophiolite melange represents a chaotic complex in which primary sedimentary sequences are rarely preserved due to subsequent tectonism. The melange is characterized by pervasively sheared and fine-grained shaly-silty matrix in which are included smaller (centimetre to hektometre) and larger (kilometre) fragments of various rocks. These are most commonly greywackes, ophiolites, cherts and exotic limestones, the youngest blocks of which are Late Cretaceous and Paleocene in age. For that reason the VZ ophiolite melange is of post-Paleocene age as distinguished from the Jurassic ophiolite melange of the DOZ. The Medvednica ophiolites are represented by tectonic and cumulate serpentinized peridotites, gabbro-diabases and basalts, transformed by postmagmatic processes, into serpentinites, metagabbros, metadiabases and metabasalts. The Medvednica ophiolites can be correlated to the ophiolites from the northwestern part of the Zagorje-Mid-Transdanubian (or Sava) Zone and the Bükk area in northern Hungary. The present position of all these ophiolites can be best explained by the mechanism of extrusion tectonics, for example strike slip faulting as a result of Oligocene and Neogene indenting of Apulia into Eurasia.